WAUKEGAN, Illinois – Surrounded by family and many friends at a Lake County Courthouse public ceremony this morning, Robin M. O'Connor was sworn in as Lake County Clerk by Chief Judge Ukena. 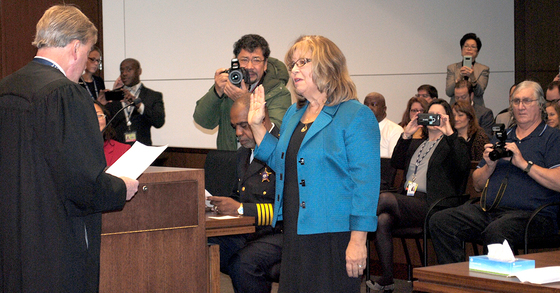 Immediately following the ceremony, Clerk O'Connor swore in the staff of both the county clerk's and treasurer's offices. Then she presided over her first Lake County board meeting. Clerk O'Connor brings a warm and cooperative approach to the clerk’s office. She is a retired Illinois school teacher, has served as a Libertyville Township trustee, and is actively involved with many civic organizations. She is a 30+ year Lake County resident and with husband, Dennis, has four grown children.